We are excited to announce that Lexi Wilson will be our Summer Intern for 2018! We recognize that the Lord has been developing gifts for leadership and ministry in Lexi for many years, and we are excited to see what He does in and through her as she puts those gifts to use in service of City Church this summer. 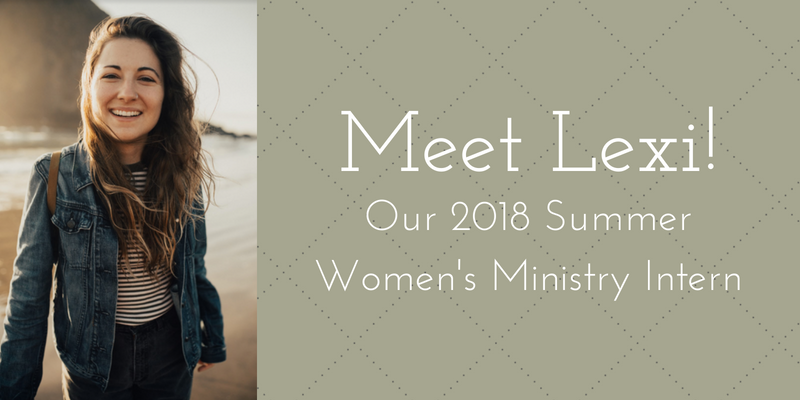 If you haven’t met Lexi, we hope you’ll introduce yourself next time you see her at church. How did you end up in Richmond, and how long have you been at City Church? How I made my way to Richmond feels a little crazy and gives me goosebumps to this day. I have a hard time sharing this story without bursting into tears because, man, does it humble me and remind me how much bigger God is than myself. I grew up in Aledo, a very small town in Texas outside of Fort Worth. I loved that town and all the crazy traditions revolving around football that came with it, but when it was time for me to go to college, I knew I wanted to challenge myself and put myself in a place where I could really experience life outside of the bubble that existed around my small town. I could have never guessed or expected that God would bring me all the way to Richmond, Virginia and all the things (mostly a LOT of growing) he had in store for me. I applied to 11 different schools and had no idea where I wanted to go. During that process I received a brochure in the mail from VCU and decided to check it out, although I had never heard of it before. I applied on a whim, enjoying that it was a respected public art school, whereas most of the art schools I applied to were small institutes. I actually really wanted to go to Corcoran College, a very small school in DC, (which I’m very glad I didn't— it is no longer a school) because they offered a photojournalism major with connections to National Geographic. While visiting that school, we also visited VCU, and it was upon walking around Richmond that I felt a pull from the Lord to be here. I am to this day in awe that the Lord gave me this opportunity, and not just at any school, but at the number one public art school at the time, I might add. I wouldn’t have ever dreamt up the life the Lord has given me here. I don’t think I had it in me to dream that big, nor did I feel deserving of such a wonderful opportunity. But he graciously brought me to this wonderful place and this church body. I started attending City Church my sophomore year in college after many of my friends I was in ministry with through Young Life started going there. Once again, it was a place I would have never guess I’d be, but to which the Lord graciously brought me. I’ve been attending for four years now. What do you do, and what does a typical week look like for you? I am an “adventure” wedding and portrait photographer with a focus in intimate weddings/elopements. I get to be friends with my couples, take them on adventures, and work to provide them with an emotional product— one that where their personalities live and breathe in these still moments! That looks a little different with every couple, but it involves a lot of drives to the mountains/remote places, hikes/frolicking through forests, lots and lots of editing in my studio, and doing what I can to be a part of my couples’ lives outside of just being a vendor. What is your favorite thing to do in the summer in Richmond? Any chance to be near to the river—Friday Cheers, river floats, sprawling out on rocks, etc. Who/what have been some of the biggest influences in your life (in any respect–intellectually, spiritually, personality-wise, etc)? My parents are my best friends and biggest cheerleaders—and they just moved to Richmond!!!! They instill confidence in myself when I don’t want to; they push me towards my dreams; and make me cry a lot (in the best way). The second has been the outdoors. I didn’t realize I was an outdoor junky until about a year ago, but I’ve never been so inspired by something. I love the metaphors waiting to be discovered about life by spending time outside. I think it’s where God speaks to me the most clearly and it’s where I feel most connected to His presence. Why were you interested in the summer internship? Honestly, I wasn’t. I’m not the person that sees themselves as worthy or capable for these kinds of opportunities. When I hear of them, my response is usually, “oh that sounds like such a cool thing for someone else”, but I have a hard time naturally picturing myself in these roles. It wasn’t until other people told me I should consider it that I began to see myself as someone who God could use in this way. What are you most looking forward to about the internship? This church has done so much in growing me. I am honored to give back in some way to the women/church body who have so graciously given so much to me. I’m also excited to be put in this ministry mindset for the church as I step out of leadership positions in other ministries. I think it will significantly change the way I interact with the church and those outside of it.